One of the reasons I wanted to organise a Card Swap was to kick start my own card making and that has certainly happened. This last week I have sneaked off to my craft room at every opportunity and have been so productive. This is one of the first cards I made, I love this set. 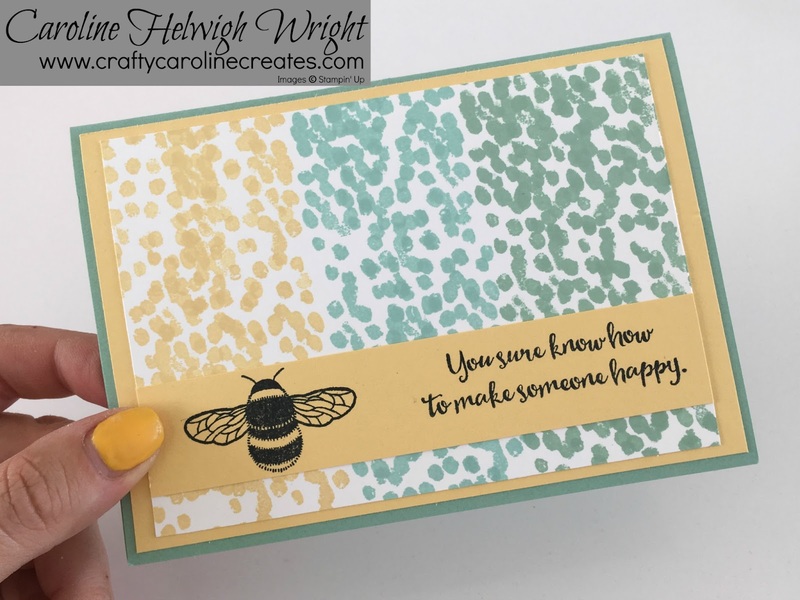 It uses just one stamp set, the background is hand stamped and the bee and sentiment all come from Dragonfly Dreams. The background uses So Saffron, Pool Party and Mint Macaron. I am looking forward to sharing lots more cards with you and hope you like this one. Love it Caroline. You have amazing creativity. Yes, I love it! The color combination is yummy. I appreciate the inspiration for using the bee. I haven't inked mine up yet! First inking for me too Michelle, kept getting drawn to the butterflies but I really like him now. Great Card! I may have to CASE this one! Thank you for sharing!